Welcome to lesson #7; we are getting close to the end now, aren’t we? My hope is that you will recognize, as you go through these last lessons, that you already know a whole lot more than you realize. These last few exercises are designed to help you “take that leap” where you put your newfound skills to work in ways you had not yet imagined. You know how to make parallel channels and tapered channels using straight line rulers and curved rulers, but so far, you’ve only used these along the border edge of a border design. 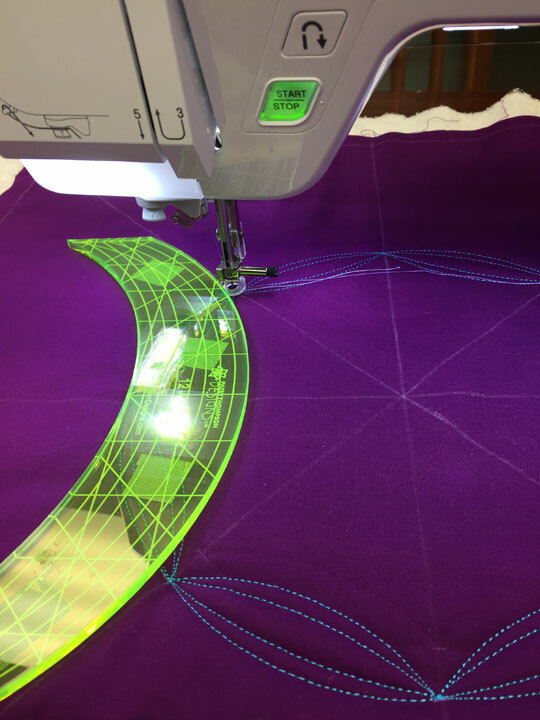 Today, you will begin using these same skills to create a variety of ruler work designs that do not follow along the border edge. 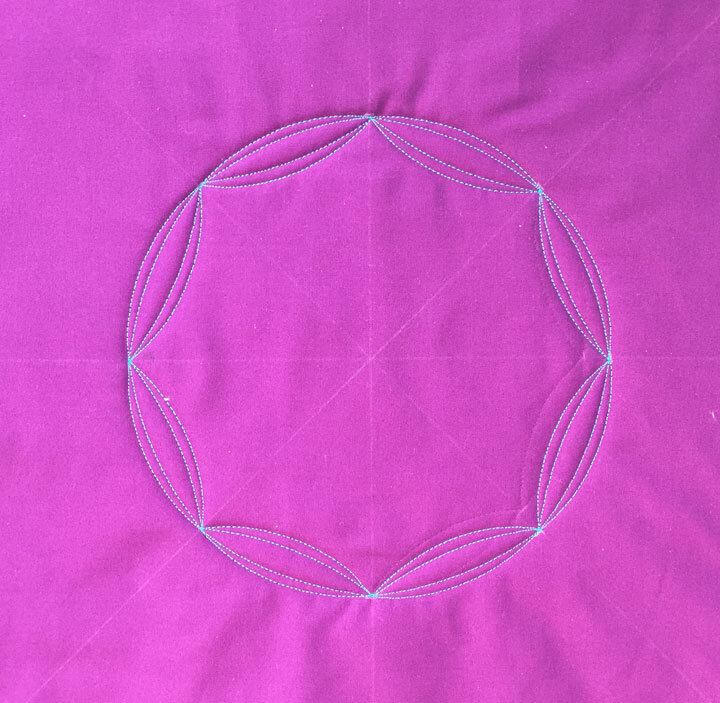 Today’s lesson will teach you how easy it is to create a circular design using rulers and channel work. Please do not freak out!! If you have followed the ruler work lessons thus far, then you are fully capable of completing the ruler work framework above. If the fill designs are freaking you out, don’t worry about them as there are many other fill designs you can use instead. Now, let’s get to it! 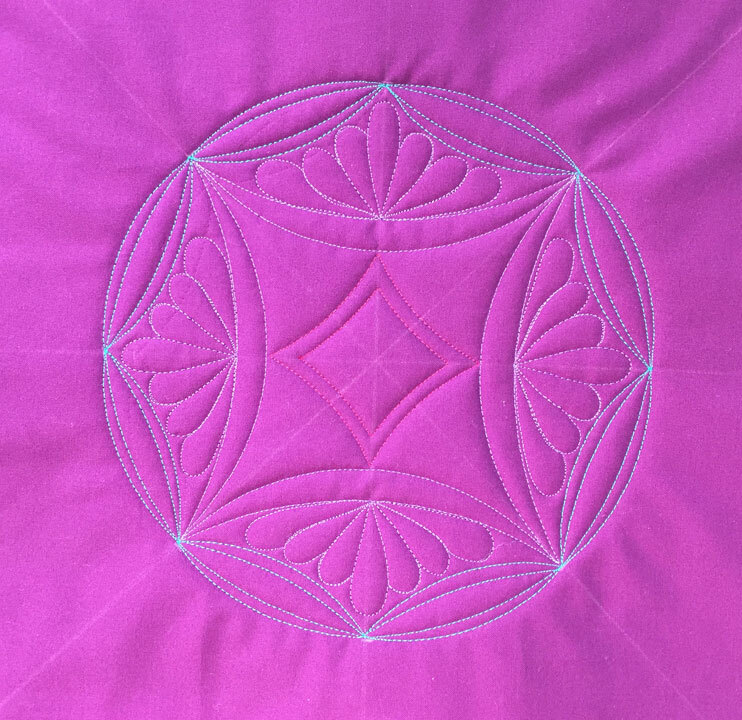 Note that where those 2 lines intersect is the dead center of the block, and it will become the dead center of your quilt design. If you didn’t already know this, commit it to memory as it is very useful. 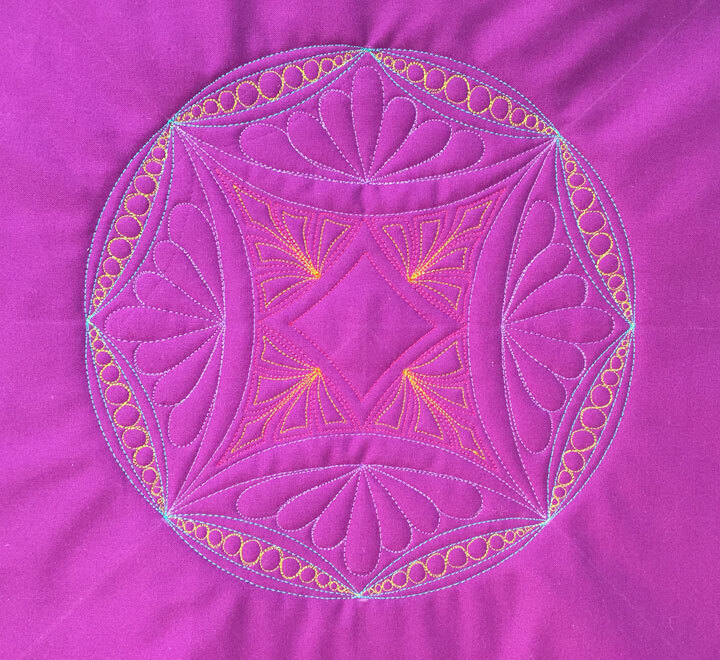 Always have a clear center point that marks your quilt block’s center, and make sure that point remains clear from the very beginning until the quilting design is completely finished. You may need to darken that point a couple times as you work, and that’s ok as long as it’s the same point you started with. 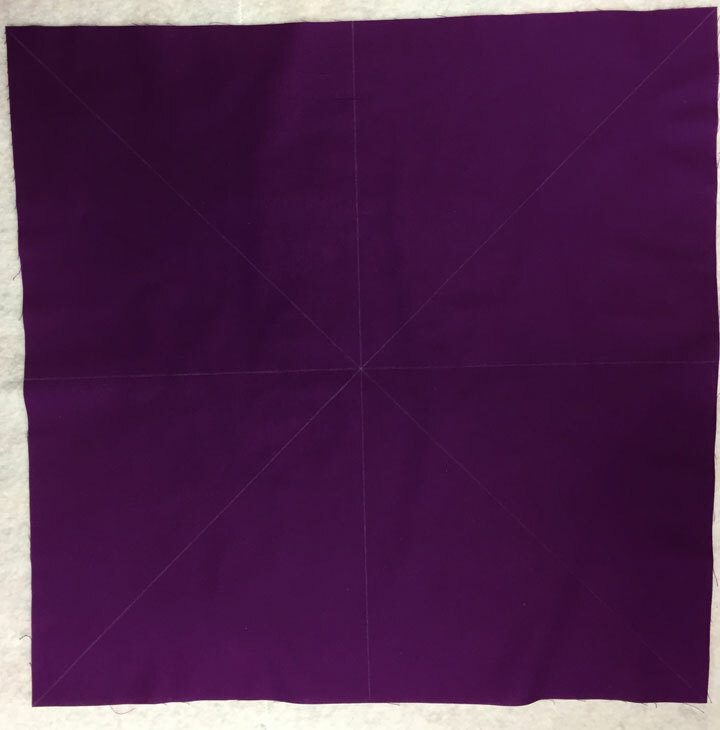 The reason I’m telling you to mark it this way is that I want you to have a specific point that is the center of your block. You need a tiny point, not a smudge or a confusing set of lines that don’t quite intersect in a point, and if you mark it as above, you should have a clear point. 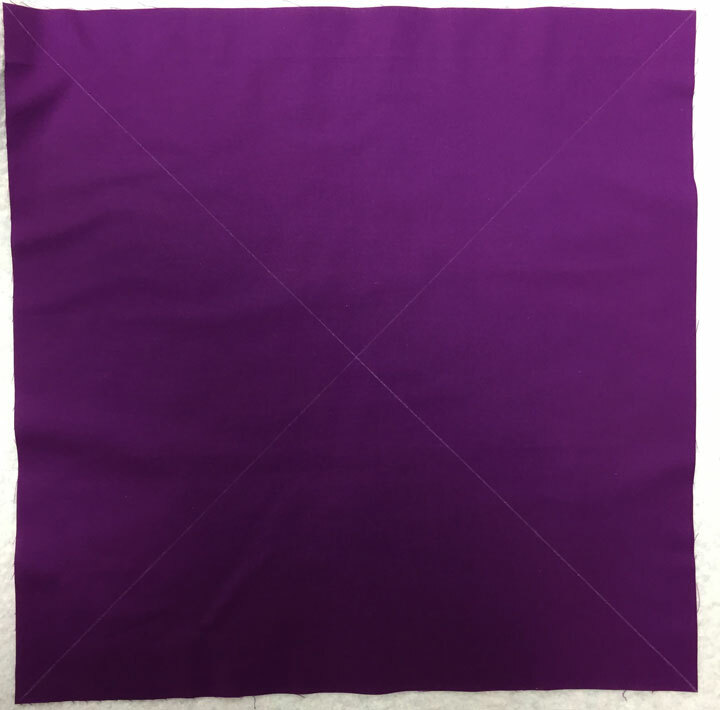 Know that if you are ever finding yourself in a spot where you want to fill a rectangular or square block with a ruler design, marking it in this exact same way will help you. 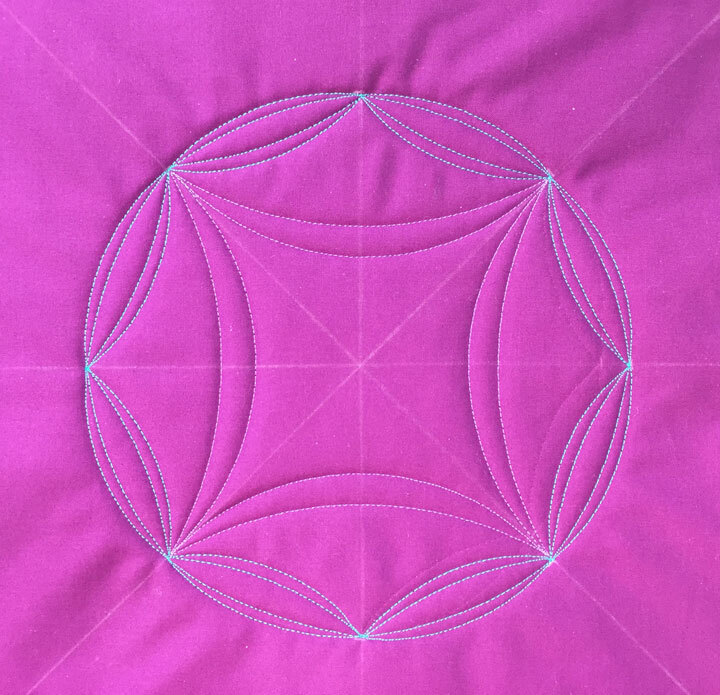 These lines will allow you to create a symmetric ruler work design even when you’re working with blocks as small as 4 to 5 inch square blocks. 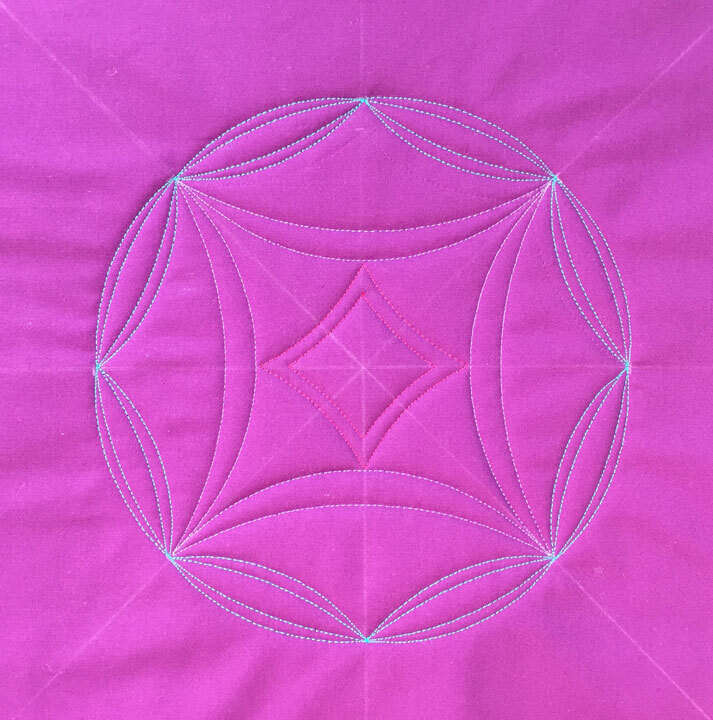 Next, draw a temporary line that is 1/2 inch inside the perimeter of your block, on all 4 sides. 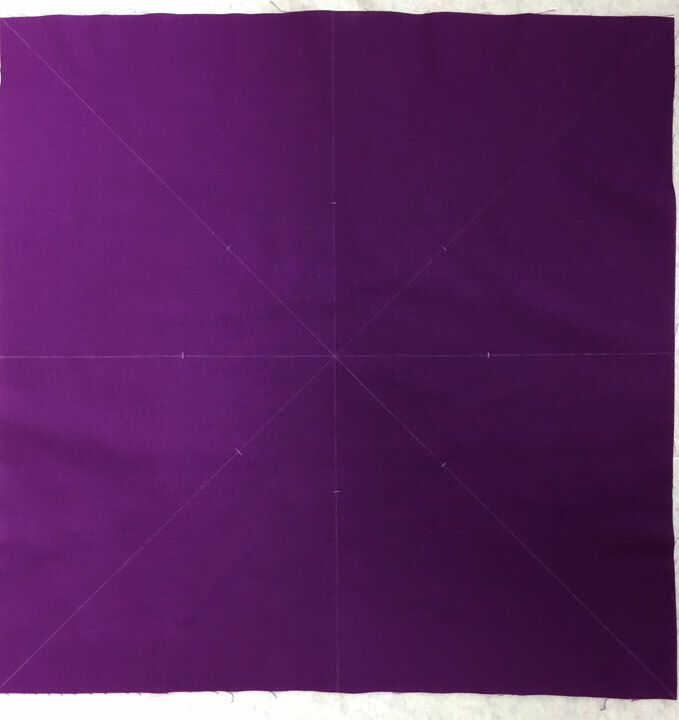 This last set of marks is to create a boundary that will ultimately be used as a seam line if you make this into a pillow or tote bag once we are completely done. 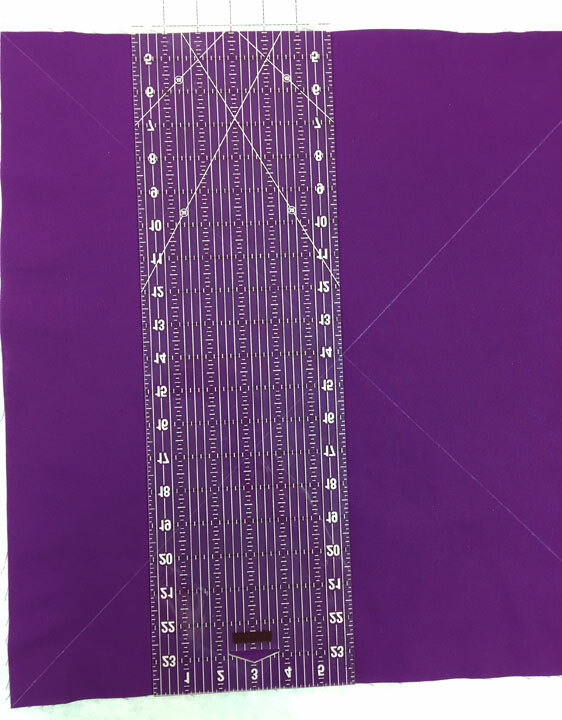 We need to mark that boundary now so we deliberately leave that section outside of the design we will be making with rulers. You have created a circle of crescents. You now know how to create a series of tapered swag channels in any size circle you wish. 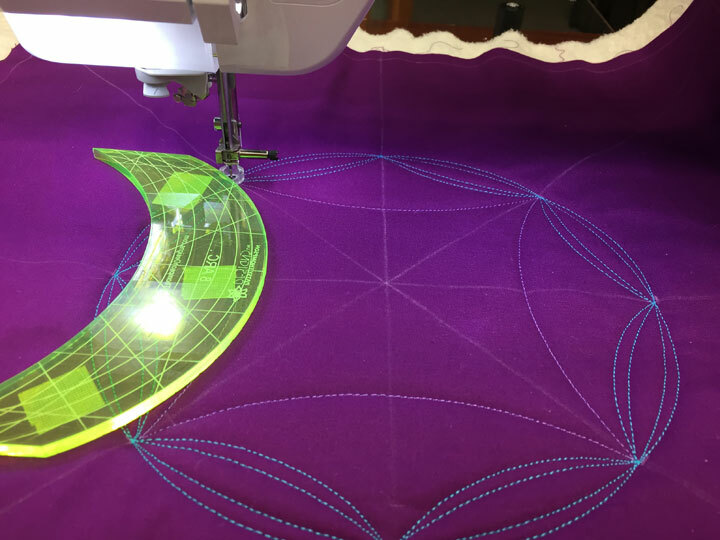 In this case, we have created a circle of crescents by stitching mirror image tapered swag channels that meet at the “cleavage points.” This is your first foray into using a tapered swag channel to create a unique design. Know that creating a circle of swags is but one of many, many, many ways you can manipulate swags into a design. I sure hope you are feeling a bit empowered now! 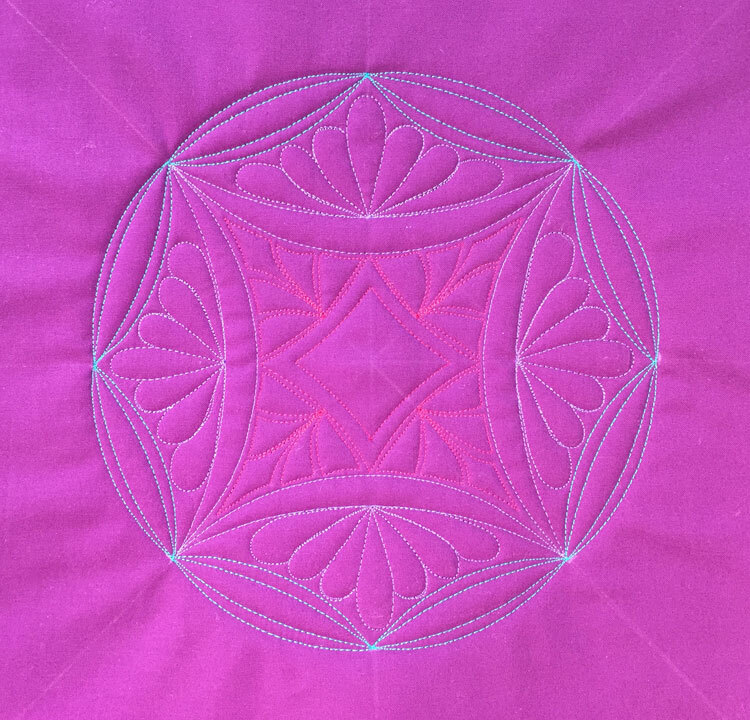 If you are asking yourself how you would do this again on your “real quilt” with its own unique dimensions, you would begin by marking those 8 straight lines that we marked at the beginning, but you would change the position of the tick marks to create the size circle you desired. 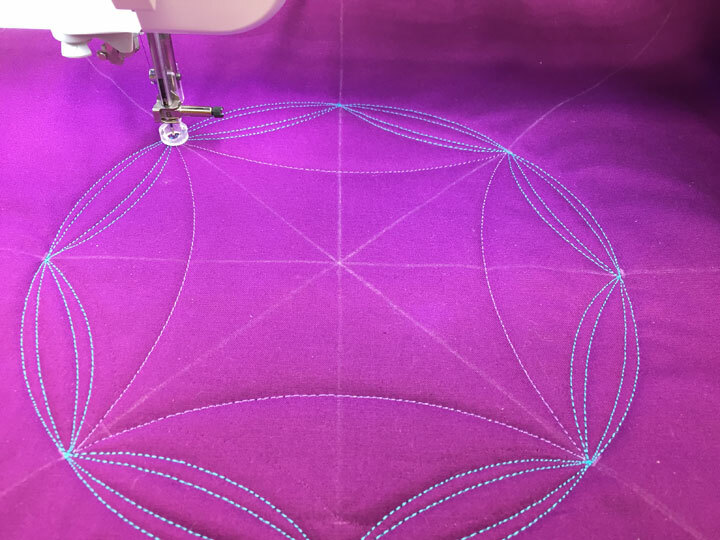 (For example, if you wanted to create a 7-inch diameter circle, you would place a tick mark 3.5 inches from the center on all 8 lines; for a 12-inch diameter circle, you’d place a tick mark at 6 inches from the center at all 8 lines, etc..) Yes, it really is that easy! 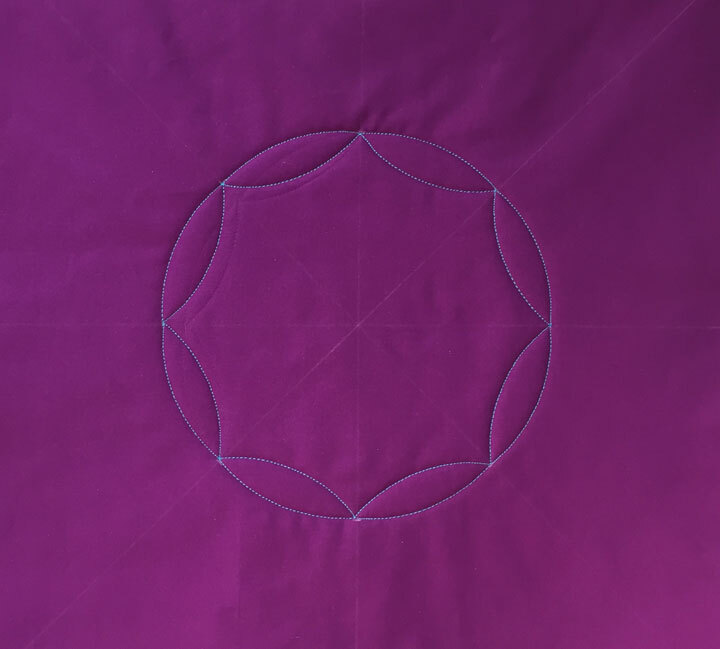 Now, here’s where you will need to start thinking…Can you count on the same arc rulers I used here to be able to make crescents that will look good in any size circle dimension? No! These rulers will work well on many sizes of circles., but not all sizes of circles. This is because the distance between tick marks will change as you change the circle’s diameter. This phenomena will happen with any design that involves swags, because you will be altering the space between tick marks and therefore altering the amount of “plunge” of each swag. (Remember back to what you learned in lesson #6.) Let’s say that all you have available are the 2 arc rulers we used for the circle of crescents above. There are 2 ways that you could work around this: a. convert this to a circle of arched swags. 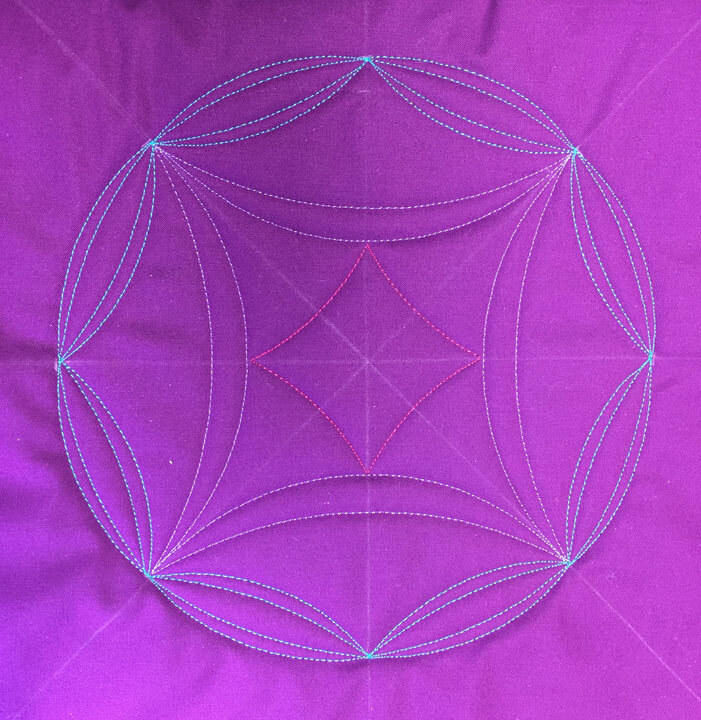 This would also look great and would enable you to use the same arc rulers, OR b. Bisect each of the marked lines we’ve been using for our tick marks and if you did this in equal halves, this would effectively create a circle of short swags and enable you to make a very large circle with beautiful crescents using the same arc rulers. Ta-da! Everything we’ve done today is exactly what you’ve been doing in the earlier exercises, we’ve just changed the starting and stopping points so that we are no longer working along the boundaries of a border. 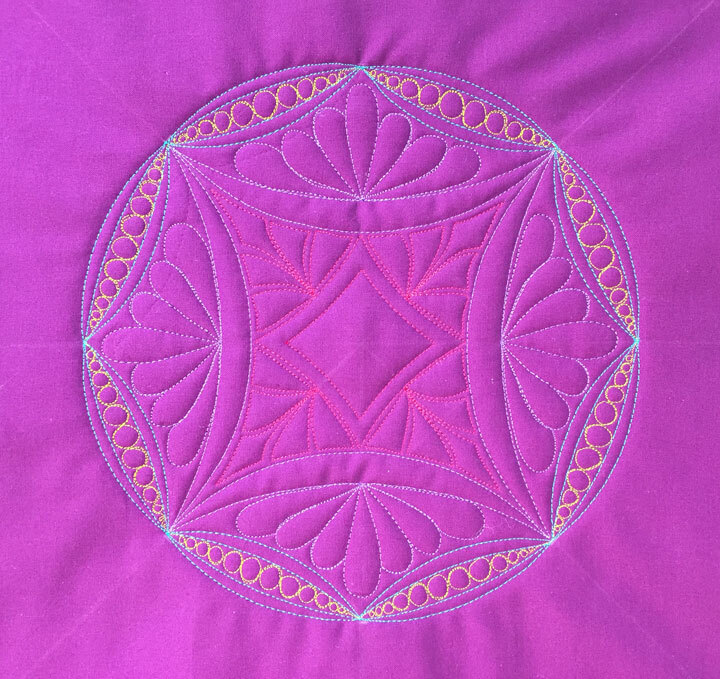 Sometimes it helps to really think about what is familiar as it helps you realize that the skills you have can help you make much more complex designs than you may think. Could you throw something into that center diamond? Yes! Personally, I’m holding off right now as I don’t have an idea that is jumping out as a great way to fill it, but if you’ve got an idea, then go for it! OMG this is beautiful. Excellent lesson. Thank you, thank you, thank you. Wonderful Patsy! I can’t wait to get going on this. Many, many thanks once again for these amazing lessons. These lessons are explaining the design processes very clearly. I appreciate the explanations of how (and why) things are done, the order in which to do them and what to watch out for. You are simplifying the processes I have been trying to do, and giving me the confidence I need to continue with my fledgling attempts to create frameworks, but now with a greater understanding of the processes. Thank you. I had previously purchased the Quilted Pineapple set of rulers and I am not seeing a 6.5 ruler, the smallest one is not marked. Will I need to purchase the set you sell to accomplish this lesson? I would have repeats of the 8 and 12 inch rulers because they were included in my bundle. May I just purchase the 6.5 ruler from ? I have completed lessons 1 through 6 and have learned a lot, I think I may go back and do them over again. Thanks for doing these lessons. You should not have to purchase any rulers from us to complete this lesson. I’m trying to teach you concepts, not to sell you rulers! There are thousands of people all over the world taking this course and they are using all kinds of rulers to do it. You are rocking it Patsy! Nobody teaches like you do, nobody! Thanks for sharing your time and talents. Patsy, when doing the featherettes, do you stop after each one, tie off & move to the next ….or…do toy travel along the swag line over to the next?